Today, 7.11.11 was 7 Eleven’s 84th birthday and they gave away 7.11 oz. slurpees all day long. We went to the one near the Tacoma Mall at 4701 S. Oakes and we weren’t the only ones with this bright idea! I had the banana, which was pretty darned tasty and dear daughter had the Berry, which was blue and she drank the whole thing so I guess it was alright. According to Wikipedia 7-Eleven is “is the world’s largest operator, franchisor and licensor of convenience stores, with more than 39,000 outlets”. 8,200 of these are in the US. The company originated in Dallas, TX, but the franchise is now owned by the Japanese Company Ito-Yokado. 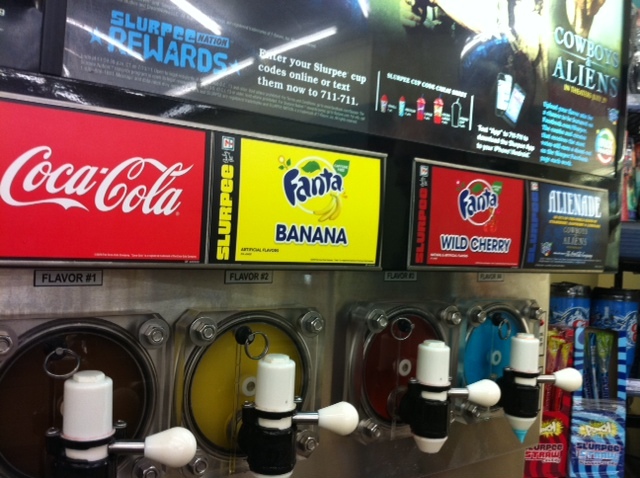 This entry was posted in Chain stores (there are a bunch of them), Stores and other places that sell you things, Tacoma, WA State - Pierce County and tagged 7-11, 7-Eleven, banana, birthday, slurpee on July 11, 2011 by admin.